Ultrasonic testing is widely used for the detection of internal defects in materials, but they can also be used for the detection of small surface cracks. Ultrasonic are used for the quality control inspection of part processed material, such as rolled slabs, as well as for the inspection of finished components. 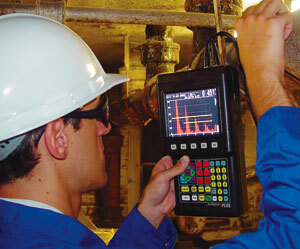 The waves used for the non-destructive testing of material are usually within the frequency range 0.5MHz to 20MHz. In fluids, sound waves are of the longitudinal compression type in which the particle displacement is in the direction of propagation; but in solids, they are shear waves, with particle displacement is normal to the direction of wave travel and elastic surface waves can also occur. The latter are termed Rayleigh waves. We also provide Advance Ultrasonic Testing Services namely Phased Array Ultrasonic Testing(PAUT) and Time of Flight Diffraction.(TOFD). Address: Plot No. 5, Sector 18A, Nerul, Navi Mumbai, Maharashtra, 400706, India.